Michael Jackson’s sad death is a shock to us all; people will always have that “flashbulb” memory of always knowing where they were when they heard of his demise. For many, they will have been sitting in front of their PC screen, suddenly aware of a flurry of tweets in Twitter about an announcement on the TMZ blog that Michael Jackson was on his way to hospital. The celebrity gossip blog said: “We’ve just learned Michael Jackson was taken by ambulance to a hospital in Los Angeles … and we’re told it was cardiac arrest and that paramedics administered CPR in the ambulance … and it’s looking bad.” Within minutes Twitter, Facebook and MySpace had ground to a virtual halt because of the huge volume of traffic generated by people sending messages and updates. In fact, these sites had not seen this level of traffic since the inauguration of President Obama – and that was a record. The traditional media, however, was comparatively slow to respond; the BBC for instance only reported the death of Michael Jackson once it had been confirmed by the Los Angeles Coroner. 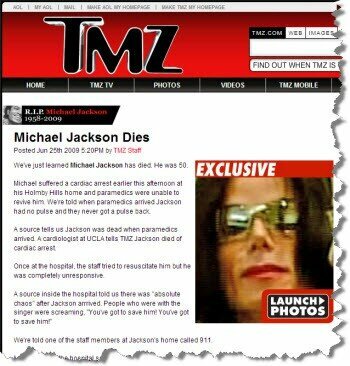 By that time, though, the Internet was awash with the details of the death, including video footage of Michael Jackson being taken away by paramedics from his home (see below). The Internet also saw a flurry of false reports about other high profile “deaths” such as Jeff Goldblum. The rapid retweeting of messages reporting his “death” – without checking the facts – only helped fuel the flames. Hence it is understandable why the traditional media waited to report Jackson’s death, rather than rely on speculative and potentially inaccurate items online. It shows that in spite of the speed of online reporting you still can’t beat good, old-fashioned checking of the facts. All too often we rely on online sources of information, but fail to corroborate what we have gleaned. In the “good old days” you could trust your sources – such as a newspaper like The Times, or The BBC. Or you would look at the publisher of a book you were reading and see they were solid and reliable. Checks like that are not so easy online and often you could find yourself using incorrect information on your own web sites – reducing the trust that others have in you. Hence, whatever you produce on your web site should have its facts checked, or you should only use trusted sources. And don’t retweet things unless you are sure of their veracity. Thankfully, the mainstream media were able to quickly check the facts on the Michael Jackson story and tell us the sad news was true. His death has a special significance for me. At the time that his album “Off the Wall” came out I was working at Polydor records, busy trying to promote bands like Sham 69 and Siouxsie and the Banshees. Many lunchtimes I’d pop across the road from our offices just off Oxford Street and go into “The Hog in the Pound” pub at the top end of South Molton Street for a beer and a sandwich. For what seemed like ages, every day I went into that pub the only music that was playing was “Don’t Stop Til You Get Enough” – the single taken from that album. At Polydor we had fought hard to beat Michael Jackson’s success and at every turn he was winning; the daily blast of his music in the pub merely served to remind us that we were battling against a huge talent. One which we shall now sadly miss. It’s strange to reflect that if Michael had died at that time the media coverage would have taken longer – maybe up to 24 hours – and the rumours about other “deaths” would only have been shared amongst a handful of pranksters in a pub or two here and there. Thirty years on and we are living in a very different world, where rumour spreads worldwide within moments and fact checking or establishing truthfulness is not so easy – yet ever more important. It’s a sad day for Michael Jackson’s family, friends and fans. But it will be a sad day for all of us if we ever started to rely on anything we read online.